Have you ever noticed how many people have a difficult time saying “no”? When we were children we learned that saying “no” isn’t polite. We had to follow what our parents, the teachers at school and the society as a whole wanted. Be good, follow all the rules and don’t cause any conflicts. I agree as long as doesn’t come at the high cost of our health and well-being. I am not saying that you shouldn’t be helpful to the people around you BUT knowing when and how to say “no” can be critical. Many people have a tremendous fear of rejection and that’s why they avoid saying “no”. As for me, this is actually one skill that I have mastered early on. I have no problem telling people if I don’t want to do something. I have said “no” to bridal and baby showers, weddings, family and friends. I have even said “no” to potential clients when I thought it was not a good fit. I think it is good business practice to learn to say “no”, and you should definitely learn to say “no” in your personal life as well. Be honest if you don’t want to do something or if you simply cannot commit to a task. This is called integrity. It is important to put yourself first. I see way too many people who are overworked, frustrated and stressed, and I am determined to help them to change that. Think about it. 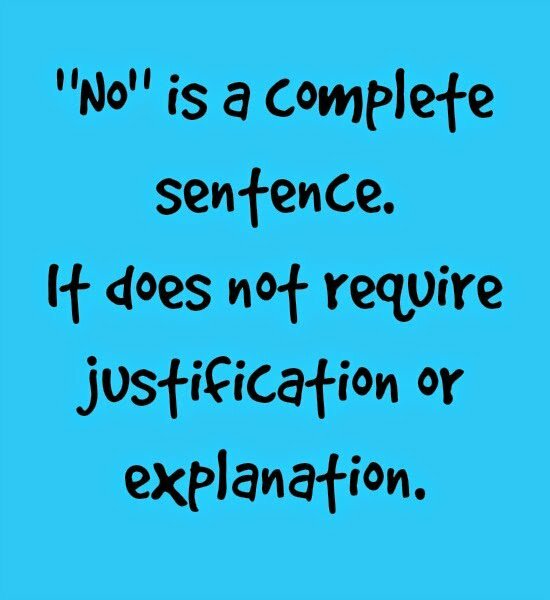 If you say “yes”, what are you saying “no” to? If you give too many “yeses” because you want to please everyone, it could mean that you die earlier because of added stress. Crazy, right? Do I have your undivided attention? Learning to say “no” will feel liberating. Are you ready to join the “No-Nation”?